WASHINGTON (April 29, 2009) -- Soldiers were challenged to get their personal finances in order and to learn to be better savers of their money during a Department of Defense-sponsored 'Financial Readiness Challenge,' April 28, at Fort Myer, Va. The day-long event included a presentation by keynote speaker and author Larry Winget, known as "the pit bull of personal development," in addition to multiple personal finance seminars, one-on-one sessions with financial advisors, and a gallery of exhibitors that included representatives from Military One Source, Thrift Savings Plan and Military Saves. Sgt. 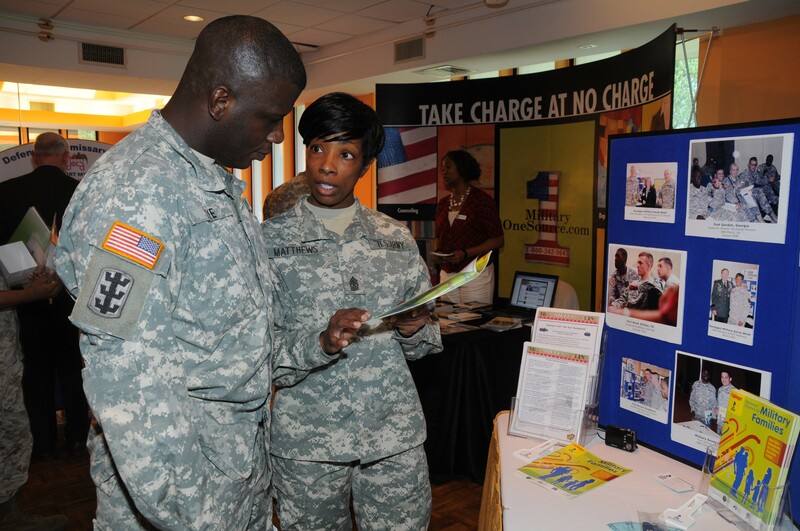 Maj. Rose Matthews of U.S. Army Family and Morale, Welfare and Recreation (right) discusses the Better Business Bureau Military Line with Sgt. 1st Class Pierre Dye during the "Financial Readiness Challenge," April 28, at Fort Myer, Va. The Financial Readiness Challenge campaign is scheduled to visit Fort Hood, Texas in July; Fort Carson, Colo., Fort Sill, Okla., and Walter Reed Army Medical Center in September; and Fort Leonard Wood, Mo. in October. The event gave servicemembers contact with professionals who provided information on budgets and spending plans, credit management, debt elimination, car buying, housing loans and foreclosures, savings and investments, and financial, estate and retirement planning. "Our goal is to get all servicemembers a financial plan," said Frank Emery, of the Secretary of Defense's Military, Community and Family Policy Office -- the agency that promoted the event. "That makes sense because that is one less thing servicemembers have to worry about when they deploy. Our philosophy is financial readiness equals mission readiness." If a Soldier deploys without his personal or financial issues accounted for, he might not be focused on the mission -- and that can affect other Soldiers, said Staff Sgt. Joel Crespo. "It affects his ability ... 110 percent actually," Crespo said. "Because he is worried about his financial distress, not his mission. He could put the lives of others in danger worrying about the distresses back at home with his family." Crespo said there are many resources available on an Army installation that can help Soldiers get on the path to financial security so they can avoid the kinds of problems that are impossible to fix when deployed. "With those resources out there, if he takes advantage of them -- the information out there -- it will set him up for success and allow him to do his job more efficiently," Crespo said. Crespo also said noncommissioned officers are themselves a resource Soldiers can go to in order to learn more about saving money and getting their finances in shape. "As an NCO, you can always teach a Soldier about saving money for the long term," Crespo said. "Soldiers get caught in situations where they don't have enough money in their bank accounts, they have vehicles that break down, or financial hardships because they don't have money put away or they don't have enough information on how to save and invest. I think that's one of the main factors we can definitely look at as far as teaching young Soldiers." The Financial Readiness Challenge Campaign is scheduled to visit Fort Hood, Texas in July; Fort Carson, Colo., Fort Sill, Okla., and Walter Reed Army Medical Center in September; and Fort Leonard Wood, Mo. in October.